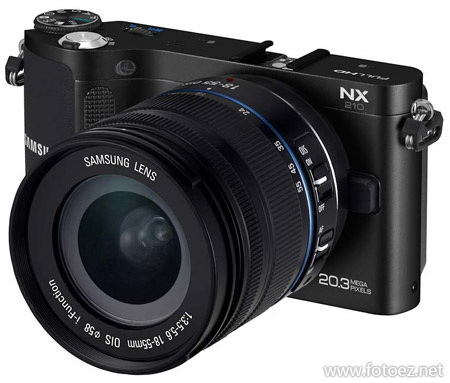 Free Download Samsung NX210 PDF User Manual, Instructions, User Guide, Owner's Manual. Samsung NX210 Mirrorless Interchangeable Lens System Camera features a 20.3MP APS-C CMOS sensor, a 3.0-inch VGA AMOLED display, Full HD movie capture and 8fps burst-shooting. NX210 is built-in WiFi connectivity, once connected, you can sharing photos or videos to Facebook, Picasa, and YouTube, or sending via email directly from the camera. The NX210 packs the power of a professional-grade digital camera within a sleek and compact design. Its ergonomically crafted exterior fits perfectly within your hand, while the topside design feels solid and looks just as sturdy. The lightweight body makes it more portable and easier to shoot in a variety of angles and positions, making it the ultimate professional-grade camera that you can carry in your pocket. NX210 equipped with a large 20.3 megapixel APS-C CMOS sensor, developed in-house by Samsung for outstanding accuracy in color and reduced noise levels. Combined with a wide range ISO (100-12800), you can create images with minimal noise, rich tonal gradations and faithful colors, even in low-light conditions. The NX210 features faster burst-shooting 8 frames per second capabilities provide an simple yet sophisticated way to capture images in total focus. The ultra-high speed Auto Focus that can rival almost any system camera and is core component of the system. The result is a fast and precise AF System that captures life's fleeting moments. And with a sequential rate of 8fps, capturing fast-moving objects in perfect clarity are no longer a challenge. With 1920 x 1080 / 30p Full HD Stereo Movie Recording, NX210 also guarantee high-quality video alongside DSLR-standard images. The mirrorless CMOS image sensor offers precise auto focus even while you shoot, it can even capture true slow-motion video. With easy access to Wi-Fi functions, the NX210 allows quick sharing with friends and family. Save photos and videos directly to a computer or cloud service while you shoot, email them, print them wirelessly, or upload them straight to Facebook, Twitter, YouTube or other social network sites. With the Wi-Fi SMART features, Images can also be shared between devices, including the ability to wirelessly share to a Samsung smartphone or tablet using Mobile Link. You can be set to automatically back-up images every time you come back into range of your home Wi-Fi network and allow control of the camera via a 'remote viewfinder' app on compatible smartphones. NX210 equipped with a 3.0-inch VGA AMOLED monitor, allowing you to easily review the picture you shot, even in direct sunlight. And because the display utilizes the latest in AMOLED technology, it’s much thinner than a conventional TFT-LCD display, making it much lighter and more compact in size. The NX210’s panoramic capabilities let you catch every detail on the horizon with the push of a button. You can create 3D images (regular or panoramic) without a special lens and wow your friends by displaying them on a 3D-ready HDTV. NX210's Smart Filter 2.0 enables access to 10 filters for applying artistic effects in-camera. Choose the Tilt & Shift Lens Effect for a miniaturized look, the Vignetting Effect for striking contrasts, Half-Tone Dot for a comic-book look, and more. With the Selective Color feature, you can even choose the colors you want to emphasize. Take Full Control of Your Pictures with i-Function 2.0, you can adjust key settings using the focus ring right on the lens. Whether you’re a novice or a seasoned pro, you can quickly choose the perfect settings for your shot.